@EXEcutor-The-Bat Yeah, disappointing. I made one a while back, but I'm way better at making sprites now, so I'm gonna revise it then upload it. 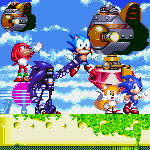 Not gonna lie, this really just looks like the right side of the body of the original sprite was mirrored horizontally, Robotnik was recolored, and the editor just called it a day.